Dominic's 2011 radio single New Creation from his Illuminate record which he co-wrote and co-produced reached #2 on the Contemporary Jazz charts and remained in the Top 10 for seven consecutive months. Dominic's debut album Fresh From the Groove was produced by Grammy Award winning producer Michael Broening and released by Nu Groove Records in 2008. Fresh From the Groove achieved multi-national radio success on terrestrial and internet radio formats including XM Satellite Radio and Music Choice. Dominic is currently performing worldwide and has been selected to perform at major music festivals including the Las Vegas Jazz Festival, Arizona Jazz Festival, San Diego Jazz Fest, Houston Wine Fest, the Green Jazz Cruise and many more. Dominic has made multiple appearances on the BET Jazz television show Studio Jams. He performed a live, in-studio concert at XM Satellite Radio'sWatercolors station with Contemporary Jazz group Turning Point In 2005. He received the Outstanding Musical Contribution award for his performance in the Arizona Office of Tourism's television documentary. Dominic has performed as a sideman in clinics for the Fender School of Bass with renowned bassist Mel Brown and live showcases for the NAMM Show in Los Angeles, CA. 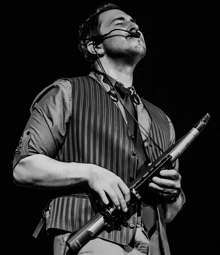 Dominic endorses Légère Reeds and Theo Wanne mouthpieces.